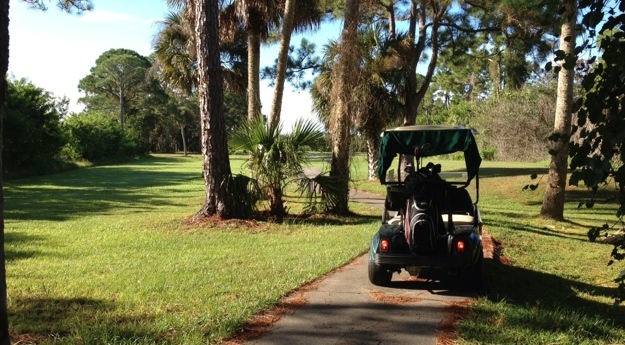 TGO (The Great Outdoors)is the name of our community here in Titusville, Fl. And I love the outdoors – this morning at 8 am I went on the golf course and played a few holes by myself – and of course took numerous photos of the outdoors that I love so much. No horses though! Perla would love this golf course pasture. Our section of TGO is called Hidden Lakes. Remember we are on a kick to wonder where the poweres to be got names for streets and towns around us! How did TGO and Hidden Lakes get their names. So, here goes the perspective – If you have ever been to Floride you know that the outdoor environment in Florida has lots of water around – you know, that is so we will have places for our alligators to live. And around here we have lots of alligators – back in 1990 the developer had a pet gator – he left the door to his office open and in walked the pet alligator – he shouted to the older, hard of hearing person working on the development plan – “Hey Joe, go outside and call that gator into The Geat Outdoors” Just before the gator up and bit his leg off, Joe shouted back “Sir, that is a very good name for this development – I’ll write The Great Outdoors on the name application page now” While Joe recovered in the hospital and got his peg leg fitted, someone submitted his papers without looking at them and that is how TGO got it’s name. Now, go research your town and see how it got it’s name. Now the Hidden Lakes thing – where in the world do you think the That name came from? Simple, there are 2 lakes which this section of homes is built around – So, Joe suggested the developer call it Twin Lakes — of course that was rejected by the God of town name in the State Town Naming office in the capital building. Uhdaunted, the developer told Joe to call it “Hidden Lakes” – “How so?” Said Joe? “Oh, to keep down the gator population we hid a few lake under houses – Jim’s house is hiding one – there are a few others – now, you know how Hidden Lakes got it’s name. Again, I say, go research your town and see how it got it’s name.